They were not exactly dancing in the streets of South Sudan's capital Juba on Friday morning. The news that South Sudan's government and rebels have signed a ceasefire deal has been welcomed by everyone I have managed to reach by phone so far. But this is a conflict-ridden region all too well acquainted with the fragility of peace talks. Besides, most people are still reeling from the horrors unleashed this past month in the world's youngest nation. "We're happy to hear they signed it," said Gatkuoth Lok, a student I met last week in the crowded camp beside Juba's airport, where some 17,000 civilians - mostly ethnic Nuers - are seeking the protection of the United Nations. "People are yearning for peace. But we don't know if it will come," he said. "Outside the compound people - Nuers - are still being killed day and night. We want to relocate this camp to another country - Ethiopia or Sudan." At her office across town, Ann Itto - a senior figure in the governing SPLM party - was still waiting to hear the details of the ceasefire deal signed late on Thursday night in Ethiopia. "I think this is a very important step forward. It should mean an end to death. We need to stop brothers from killing brothers," she told me. "But we're waiting to receive details from our delegation. The ceasefire creates room for further discussion of the actual political issues that have not been put on the table. "We have to have faith so we can build our future." Those political "issues" are formidable. They range from the highly specific demand by the rebels that 11 politicians currently under arrest in Juba be released to the more general need to reform the SPLM, and to address wider issues about corruption, impunity, ethnic tensions and a bitterly divided national army. "Personally I'm somewhat sceptical," was how one seasoned observer in Juba put it to me, speaking off the record and citing not just the enormous gulf between President Salva Kiir and his rival, Riek Machar, but also the practicalities of policing any ceasefire. "The SPLA [South Sudan's army] has reasonably strong command and control, but not so much on the rebel side. 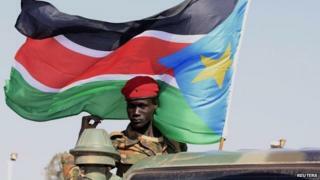 "What will the SPLA consider a violation of the deal? Cattle raiding by some Nuer?" asked the observer. Others point to the strong, partisan involvement of neighbouring Uganda - which has strong commercial and political interests in South Sudan and whose army has been fighting on the government side - as an obstacle to peace. "The problem is the implementation [of the ceasefire],"said former government minister Peter Adwok Nyaba - a strong critic of President Kiir - who was briefly detained in Juba in December. "[Uganda's President] Museveni acts like an ancillary president [of South Sudan] and that could be enough to prevent implementation so long as he has his forces here. "We'll wait and see what will happen. We want to see [the 11 detainees] released." As for the humanitarian impact of the ceasefire, Ariane Quentier, a spokeswoman for the UN mission in South Sudan (Unmiss) said: "The only thing we can do is hope." "Yesterday was fairly quiet. We welcome the signing and call on all parties to grant access - it's really important," Ms Quentier said. "Over 490,000 people have been displaced. We estimate only 200,000 have been accessed by humanitarian actors," she said, adding that the ceasefire would also enable UN investigators to search for more evidence of "what we think are massive human rights violations". Another experienced aid worker, speaking on condition of anonymity, bitterly criticised both sides in the conflict for systematically looting humanitarian supplies, attacking staff and stealing cars. "It's too early to say if the ceasefire will change that. "It may give us a bit of space to breath and recover assets and start to engage with those in control. Fingers crossed."